Our popular drying dog coat with microfibre towelling but this time with an added underbelly. 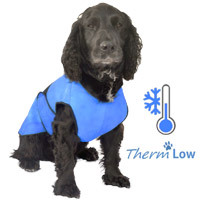 These coats are perfect for drying your dog when they get wet and also keeping them warm. 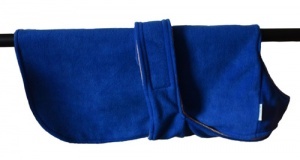 Use them after a bath at home or even after a wet walk or when your dog has had a swim. 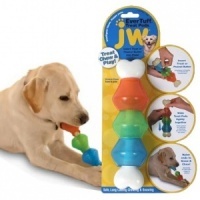 Pop one onto your dog in the car on the way home to get them dry and keep them warm. 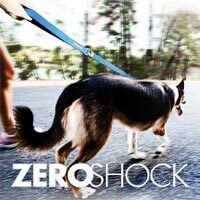 Simply slip it over your dog's head and fasten the underbelly strap. 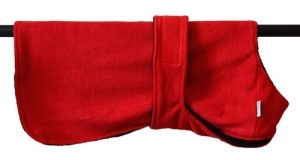 Microfibre towelling dries your dog much faster than standard towelling and has much greater absorption properties so your dog dries in extra quick time. 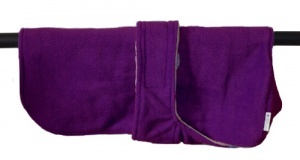 No more messing about with bulky, ineffective bath towels. No more chasing a wet dog around the house. 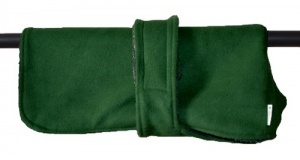 No more cold, wet dogs shivering after walkies, a swim or bath time. 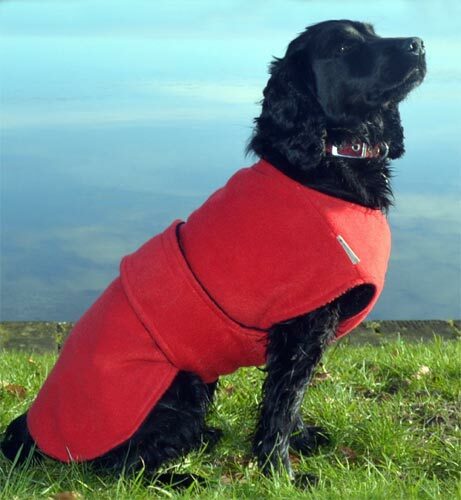 These coats fit snug on your dog ensuring moisture is quickly absorbed. And with the added underbelly protection you can be sure that every part of your dog gets dry. 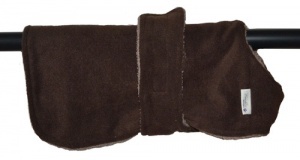 These drying dog coats have a high quality black microfibre towelling body and belly liner. 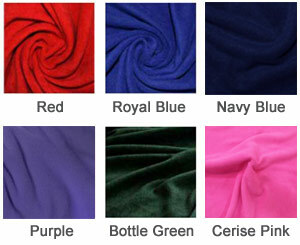 The outer part of the coat is soft, cosy fleece in a great choice of colours. The microfibre towelling absorbs water from your wet dog. 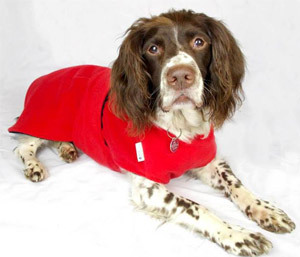 As the dog dries, their body heat then also dries the towelling, so when you remove the coat you will often find your dog and the drying coat are both dry. Not just for bath time, they are also great for in the car. 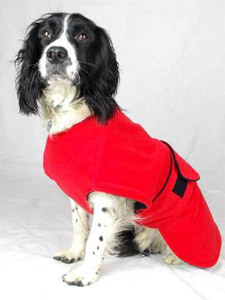 If you have been on a fun but wet walk simply put the coat on your dog and let them get warm and dry all the way home. Or they can be used in the house and are especially good at preventing wet beds and sofas if your dog usually tries to get dry by rubbing against all your soft furnishings. Wonderfully versatile and very useful. 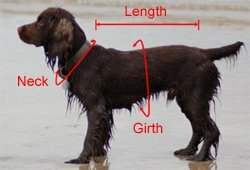 Length - Measure from the base of the dog's neck to the base of the tail (or longer should you prefer). There are 3 designs to choose from. You are currently viewing the 'Underbelly' drying coat. Just the job for our young Chocolate Labrador Stanley. Will be giving it a full "road test" when on holiday in Somerset in a couple of weeks. love it & both orders although bespoke arrived much quicker than expected. This is a substantial drying coat for my labrador - her coat is very thick and she takes time to dry off, particularly in winter. This coat arrived as stated, not cheap but seems to work very well and is of excellent quality. 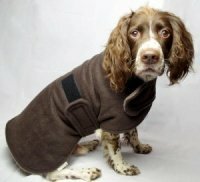 Very pleased with the coat, its a perfect fit for my springer spaniel and it dries her out really quickly, particularly her tummy. The coat itself also dries out rapidly so it's ready to use the next day. Only problem now is we need a second one for our other springer as it's so good! This really is a great product. I bought it as a present for my sisters dog (a labradoodle). He loves it. It is easy to fit, dries him quickly and keeps him warm. The ordering process and delivery all great. This is the second coat I purchased as I was so pleased with the first one I purchased for my spaniel. I decided to buy one for my daughters dog. Only one small negative the first coat I bought had a clip for under the tail this keeps the coat in place. the second coat I bought does not have this and the coat slips off slightly. We ordered a bespoke coat with the underbelly as we had a very active (half fish- half dog) German Shepherd who adored mud and water. 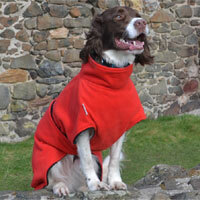 The fit and quality of this coat was very good and it washed and dried we'll. We also used it when he was unwell. When he was elderly it kept his hips warm and he used it after his hydrotherapy sessions. Excellent, would recommend the underbelly design for a more secure fit. Thinking of buying another. This is just what my dog needed. Will save the dog walker time too. Easy to put on and take off. Only 4 starts as I would have liked the Green coat but it was not available when I did the bespoke order. The other 2 coats I ordered were gifts and have been received well too.